Price was born in Leyton, England, to Philip Price, a tailor, and Fanny de Solla, a singer. He began work in 1938 as an assistant in a physics laboratory at the South West Essex Technical College, before studying Physics and Mathematics at the University of London, where he received a Bachelor of Science in 1942. 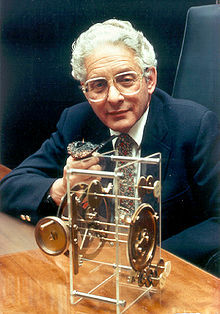 He obtained a Doctor of Philosophy in experimental physics from the University of London in 1946. In 1948 Price worked as a teacher of applied mathematics at Raffles College, which was to become part of the National University of Singapore. It was there that he formulated his theory on the exponential growth of science, an idea that occurred to him when he noticed the characteristic logarithmic curve of the Philosophical Transactions of the Royal Society between 1665 and 1850, which he had stacked against his wall at home while Raffles College had its library built. After three years, Price returned to England to work on a second Ph.D., in the history of science, this time at the University of Cambridge. During his Ph.D. studies, he accidentally discovered Equatorie of the Planetis, a Peterhouse manuscript in Cambridge University Library, written in Middle English, which he attributed to Geoffrey Chaucer. It is now attributed to a St Albans monk called John Westwyk. Around 1950, Price adopted his mother's Sephardic name, "de Solla", as a middle name. He was a "British Atheist ... from a rather well-known Sephardic Jewish family", and although his Danish wife, Ellen, had been christened as a Lutheran, he did not, according to their son Mark, regard their marriage as "mixed", because they were both atheists. After obtaining his second doctorate, Price moved to the United States, where he served as a consultant to the Smithsonian Institution, and as a fellow at the Institute for Advanced Study in Princeton, New Jersey. His next post was at Yale University, where he worked until his death, serving as the Avalon Professor of the History of Science, and as chair of a new department that encompassed the histories of science, technology, and medicine. In 1984, Price received, posthumously, the ASIS Research Award for outstanding contributions in the field of information science. Price's square root law or Price's law pertains to the relationship between the literature on a subject and the number of authors in the subject area, stating that half of the publications come from the square root of all contributors. Thus, if 100 papers are written by 25 authors, five authors will have contributed 50 papers. Price's law is related to Lotka's law. "An ancient Greek computer", in Scientific American 200 (6):60-67 (1959). De Solla Price, D. J. (1965). "Networks of Scientific Papers". Science. 149 (3683): 510–515. Bibcode:1965Sci...149..510D. doi:10.1126/science.149.3683.510. PMID 14325149. "Citation Measures of Hard Science, Soft Science, Technology, and Nonscience", in Nelson, C. E. & Pollock, D.K. (eds. ), Communication among Scientists and Engineers, Lexington, Massachusetts: D. C. Heath and Company, pp. 3–22 (1970). Price, D.J. de Solla (November 1974). Gears from the Greeks. The Antikythera Mechanism: A Calendar Computer from ca. 80 B. C. Transactions of the American Philosophical Society. New Series. 64. pp. 1–70. doi:10.2307/1006146. ISBN 978-0871696472. JSTOR 1006146. The Origin of Clockwork, Perpetual Motion Devices, and the Compass, FQ Books, July 6, 2010), ASIN B003YMNPOE. with D. J.; Wang, Ling Heavenly Clockwork: The Great Astronomical clocks of Medieval China by Joseph Needam, Cambridge University Press (1678) ASIN B01JXO3E0Q. Measuring the Size of Science, 1969, Israel Academy of Sciences and Humanities, ASIN B007EMQHT0. An International Checklist of Astrolabes, 1955, Peyronnet, ASIN B0007JKDJ2. The Differences between Science and Technology, 1968, Thomas Alva Edison Foundation, ASIN- B0007HNK3U. Scientific Humanities: An Urgent Program, 1957, ASIN B0007KAV84. Portable Sundials in antiquity: Including an account of a new example from Aphrodisias, 1969, ASIN B0007K65O8. The Little Ship of Venice: A Middle English instrument tract, 1960, ASIN B0007JV620. Chaucer's astronomy (Weekly evening meeting), 1952. Contra-Copernicus, 1952, Royal Institution of Great Britain, ASIN- B0007KCWS6. Equatorie of Planetis, 1955, 1st ed, Cambridge University Press, ISBN 978-0521059947. ^ Crawford, S. (1984). "Derek John De Solla Price (1922-1983): The man and the contribution". Bulletin of the Medical Library Association. 72 (2): 238–239. PMC 227421. PMID 6375781. ^ Mackay, Alan (1984). "Derek John de Solla Price: An Appreciation". Social Studies of Science. 14 (2): 315–320. doi:10.1177/030631284014002013. JSTOR 284662. PMID 11611467. ^ Travis Nicholls, Paul (December 1988). "Price's square root law: Empirical validity and relation to Lotka's law". Information Processing & Management. 24 (4): 469–477. doi:10.1016/0306-4573(88)90049-0. Retrieved 24 September 2017. ^ Allison, Paul D.; Price, Derek de Solla; Griffith, Belver C.; Moravcsik, Michael J.; Stewart, John A. (1976). "Lotka's Law: A Problem in Its Interpretation and Application". Social Studies of Science. 6 (2): 269–276. doi:10.1177/030631277600600205. JSTOR 284934. ^ The technical elements of Price's treatment relied heavily upon previous work by Herbert A. Simon, but Price was the first to apply the idea to the growth of a network. ^ Price, D.J. de Solla (November 1974). Gears from the Greeks. The Antikythera Mechanism: A Calendar Computer from ca. 80 B. C. Transactions of the American Philosophical Society. New Series. 64. pp. 1–70. doi:10.2307/1006146. ISBN 978-0871696472. JSTOR 1006146. ^ De Solla Price, D. J. (1970). "Smiles at the Unobtrusive". Nature. 226 (5249): 985. Bibcode:1970Natur.226..985D. doi:10.1038/226985a0. PMID 16057627. ^ De Solla Price, D. J. (1969). "Citations of literature". Acta Cytologica. 13 (10): 544. PMID 5260004. ^ De Solla Price, D. J. (1967). "Citation indexing". Journal of Histochemistry and Cytochemistry. 15 (5): 299. doi:10.1177/15.5.299. PMID 6033265. ^ De Solla Price, D. J. (1967). "A guide to graduate study and research in the history of science and medicine". Isis; an International Review Devoted to the History of Science and its Cultural Influences. 58 (3): 385–395. doi:10.1086/350271. PMID 4867473. ^ De Solla Price, D. J. (1964). "Ethics of Scientific Publication". Science. 144 (3619): 655–657. Bibcode:1964Sci...144..655D. doi:10.1126/science.144.3619.655. PMID 17806989. ^ De Solla Price, D. J. (1963). "Letter to the Editor". Science. 139 (3555): 682. doi:10.1126/science.139.3555.682. PMID 17788361. ^ Price, Derek J. de Solla (1975). Science since Babylon. New Haven, Conn: Yale University Press. ISBN 978-0-300-01797-7. ^ Gillispie, C. C. (1961). "Science Since Babylon. Derek J. de Solla Price. Yale University Press, New Haven, Conn., 1961. 149 pp. $4.50". Science. 133 (3467): 1817. Bibcode:1961Sci...133.1817M. doi:10.1126/science.133.3467.1817. ^ Price, Derek J. de Solla (1963). Little science, big science. New York: Columbia University Press. ISBN 978-0-231-08562-5. This Week's Citation Classic: Little Science, Big Science. ISI. Current Contents 29:18 (July 1983).